Finding something different to give you that little boost can be difficult. Yes, there are canned energy drinks out there, but some people don’t like the way they make them feel. Shake the Crave has come up with a powdered mix that you can add to Milk (2%,1%,Skim, Soy, Almond) and you can control the calories in the milk as well. It comes in a nice pouch. It did open easy from the top, no need for scissors. The flavor I tested was Chocolate, there is also a Vanilla one, but I am not so keen on Vanilla. The instructions on the packet are clear, but there are 6 steps just to get to the drinking part. It says for best results to blend the ingredients in a blender. I did not want to pull out the big blender from under the counter, with stuff in front of it, so I used an immersion blender instead. It blended fine, I started to drink the shake and about half way I stopped. I could not get past the taste. So I did not want to just leave it at that, so when my wife got home, I asked her if she would try the other Shake Mix Pouch just to give it a thorough review. We prepared it the same way I did the first time, and she goes to try it, and stops about half way as well. She had a problem with the taste. That all said, the Shake Mix is filled with nutrients that can really make your day more productive and energetic. You can use it as a way to start the morning, or take it to work as a snack, or just a quick meal on the go. My overall rating, I give it a 3 out of 5 stars. I like the product idea, I like the pouch as I think it would be perfect to keep in an emergency kit, with other items, but when my thought went to wanting to add chocolate syrup to the mix, I said to my wife, It needs just a little bit more of chocolate flavor. Since everyone’s palettes are different, you might find that the flavor is fine, and that you want to make this a part of your normal routine, check out the offer below from the sponsor. “Try Shake the Crave vanilla and chocolate shake mix! For a limited time, the manufacturer is willing to offer my readers 2 FREE sample packets of Shake the Crave vanilla or chocolate shake mix. 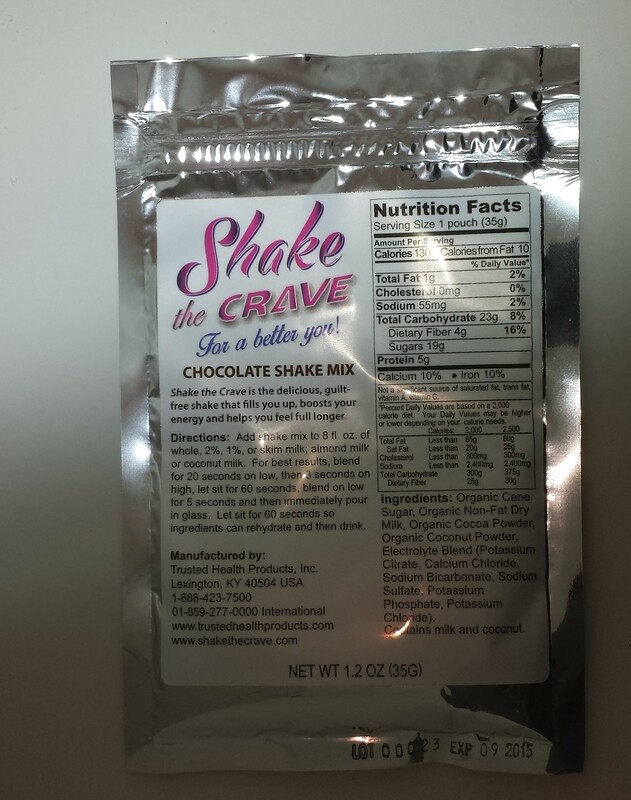 They said they would love to have our readers try out Shake the Crave and agreed to send the 2 sample packets FREE if our readers would pay a minimal shipping and handling charge of $4.95. This is a one-time only offer! Click here to get your 2 FREE sample packets now! You can visit their website here, they are also on Facebook. Take time to check them out! This looks like something I need to try out. Thanks for the review. I would be interested in trying this sometime. would be good for an emergency kit. I will have to try this. Who knows I might like it. Im always skeptical of these shakes.. I love tge idea of shakes being energy booster/ meal replacement but I would rather make me a healthy smoohtie and save the money.